I have NB fender liners, but nothing for an NA. Don’t have spare ignitor or spindles. 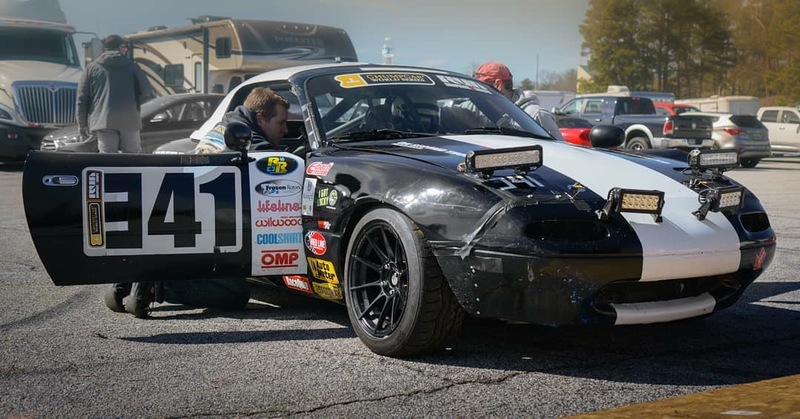 Over the past few years I’ve acquired quite a few Miata parts I don’t need: OE Hardtop with glass, a little rough for a street car, but would work great for a race car. NA6: - full disassembled 1.6 engine, warped head from overheating, block will need honing at the least - 1.6 VLSD diff, was making noise when removed, believe to be pinion bearing - 1.6 axles in good shape - 1.6 stock header/downpipe, header has some leaks at the merge NB1 (99): - 3.9 Torsen with housing - new header (installed once, never ran) - stock exhaust manifold/downpipe - Basically any other 99 part except the engine/trans is available, dark green car, most exterior parts are good except driver fender PM or email me (tchapma1@hotmail.com) for details on anything. I’ll be at Road Atlanta for the test day, and assuming the car stays together, at VIR in March. I don’t have anything above packed for RA, but if you get me a request by Thursday afternoon I might be able to get it in the trailer. Rear flares required with 225s? Im just about to do the same swap to my 91 NA6. In 17-18, I’ve been running an NB diff for the 25 point hit. When I first started talking to tech about swaps, it was mentioned that I could just claim is as a 99 and take the 99 points. If that is the case a 99 swapped 91 would be 350 base points, but I can use everything off the 99 (fuel tank, brakes, bracing, diff, etc). It sounds like now that isn’t the case, that I start with NA8 points (300), 50 points for the engine swap, and then another 25 for the diff swap? So I end up with 375 base points instead of the 99 base 350 even though it is pretty much the same car? Basing it off the NA6 points (250) the engine swap would be 50, the diff swap would be 25. This would be if I didn’t want to use the bracing or bigger tank. depending on the formula it ranges from 325-375 points. Depending on the answer here, I might change my mind on how I handle the swap. Anything happen with this? Or did I miss the post? All in all the 341 OST Racing Miata did pretty well. First time at the track for all of us, most had never driven in the rain prior to the event. Saturday was just a mess, the car didn’t seem to have as much grip as a lot of the front runners. We had 1 unplanned stop about 20 min into the race when we got hit in the driver door/rear quarter going into the S’s. Then a later stint another car spun into us coming out of 4 while passing us on the outside causing the driver door not open, and the fender to rub on the tire. I was driving the last stint of the day, the S’s were just downright dangerous, it seemed like almost every other lap someone had gotten sucked into the pit and got stuck. The straight coming out of 5 the car was basically hydroplaning the whole way down. At the finish I was soaking wet on the driver side and getting very cold. Finished the day 22nd. Sunday had ups and downs due to the varying track conditions. They didn’t instill much confidence in a couple of the drivers. Our strategy probably could have been better on the fuel stops, we ended up fueling each stop (1.6 Miata) as we were burning about a half tank each session. We didn’t want to cut someone short for drive time or run out on track. Finished the day 20th. The facility at Barber is really nice at the start of the weekend. The grass really took a beating Saturday. Definitely want to give the track a shot in the dry! We were able to live stream both days on YouTube using the Yi4k to a Verizon Mifi. Video turned out great, was as good to not have to change out cameras/SD cards at pit stops. Being racecast.me isn’t around any more, is everyone just doing YouTube live? Or are other services being used now? How do we link the video streamed above to the Champcar live cast? As far as camera go, it looks like the GoOro Hero7 Black has the ability to live stream, it also does have GPS and accelerometer, can you overlay both on the live stream, or is it video only? If only video for live stream, I might get the Yi4k for streaming as the cost is quite a bit lower. Thanks in advance for any info! Car #341 - On Second Thought Racing We had a pretty good, mostly uneventful weekend. Being none of us had driven AMP before, we got pretty respectable times out of our NA6 Miata. We had a lot of close/back and forth racing both days. All of the drivers enjoyed the roller coaster track that it is! We had a few spins/off tracks that cost some time, but overall pretty happy with the 11th Sat/12th Sunday. As with every race, you learn a few things to hopefully improve the next race. The car didn’t have any problems either day, wish I could say the same about the truck and trailer on the way home. Lost a trailer tire about 20 min south of Knoxville, got back on the road and had the alternator go out on the truck about 20 min later. They turned a 3.5hr drive back to Nashville into a 6hr drive. Looking forward to our next race at Barber in Dec. Thanks for all the feedback! It sounds like everyone has concerns with fronts, any concerns on the rear other than during contact? Those aren’t as quick of a fix, I do have two spare rear knuckles assembled for spares at every race. I have a new set of cheap hubs that I carry in the spare box, I’ll probably put those on for the next race and then repack the ones on the car for spares. The car is an NA6 running 225 RS4 on 15x8s for what it is worth.